Recently, I made a mad dash from the subway to the Long Island Rail Road at Penn Station to catch a train that was about to leave. As I weaved in and out of people, I glanced up at the departures board and briefly saw "7:44 Ronkonkoma Track 19." At least, I THOUGHT that's what it said. I flew down the steps and jumped onto the train at Track 19 as the doors closed. Made it! I made my way down the aisle and found a seat. As I settled in, I looked up at the train's destination screen, like the one in the image to the right, circled in yellow. That little departure screen typically alternates between the train's final destination and the next stop. My final destination is usually Huntington or Ronkonkoma. That night, the sign indicated "Great Neck," and the automated announcement confirmed, "this is the train to Great Neck. The next stop is Flushing." In my haste, did I get on the wrong train? How embarrassing. I made this mistake once before, a long time ago. Then again, the destination screens are sometimes wrong. So I said to myself, "no, it's good. You know you got on the right train." Or did I? Can't be sure. If you're a woman reading this blog, you know there was a very simple solution to the predicament. That is, ask someone. But, if you're a man reading this blog, you know that solution would not work. 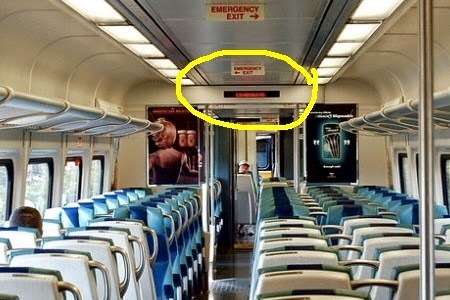 There was NO WAY I would sit there and ask the guy next to me if the train goes to Great Neck. No way. As the train continued on, I was hoping for a conductor's announcement indicating that the automated system was wrong. That didn't happen. So, I started making mental plans for getting from Great Neck to home, just in case I'd gotten on the wrong train. To understand the next part of the story, you have to understand a little about how the Long Island Rail Road is organized. To explain it, I'll use a crudely drawn diagram, shown on the left. 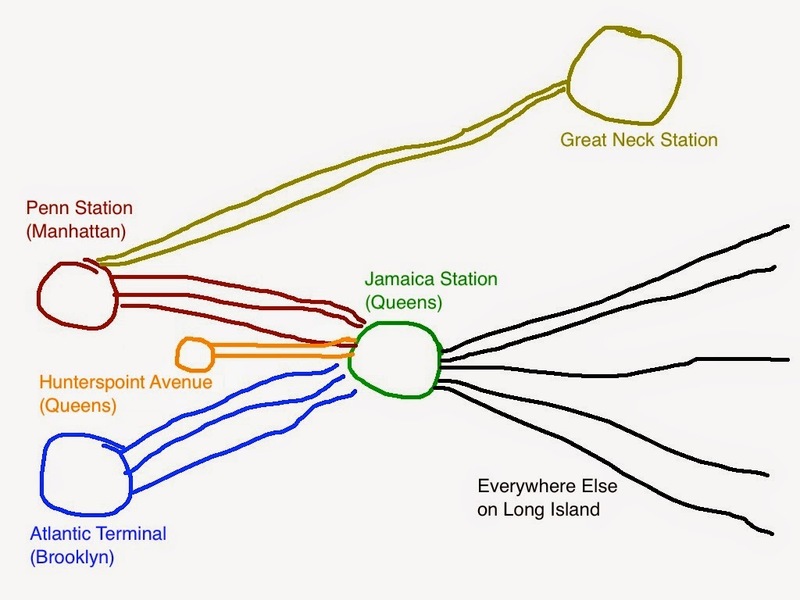 You see, all trains from New York City (Penn Station, Hunterspoint Avenue, and Atlantic Terminal) have to go through Jamaica Station in Queens. It is the "knot" in the "bow tie." Or as I prefer to call it, the "pointless bottleneck." Given that all trains have to converge there, there is a slowdown, which adds ten minutes or so to the average commute. The exception is the Port Washington line, on which Great Neck is a stop. Great Neck is one of the best commutes on the Long Island Rail Road, which is why a 2,500 square foot "fixer-upper" house there sells for approximately $350 million. Plus taxes. Doors, windows, and roof sold separately. But, oh, the commute! Now that you are armed with this knowledge about the Long Island Rail Road, you realize that if we were to get to Jamaica Station, there would be no way we could go to Great Neck. Let's get back to the story. The train slowed down. Were we approaching Jamaica station? I wasn't sure. It was dark and I couldn't see much out the window. Yes! I see something familiar! We are approaching Jamaica! I'm saved! Or am I? Can't be sure. What if there IS a train that goes from Jamaica to Great Neck that I don't know about? It's not as though I travel to Great Neck much. The automated announcement once again said, "train to Great Neck." People got off the train, people got on the train, the doors shut, and off we went. Still no announcement from the conductor, and nobody said a word about the automated announcement. Perhaps they were sure it was wrong, but, perhaps they were sure it was right! Just then, the conductor came on the PA and announced, "this is the train to Ronkonkoma. Sorry about the automated system, we're having some problems with it this evening." "Ha ha!" I said to the guy sitting across the aisle. "As if we didn't know!!!" He agreed. I think I saw him wipe a bead of sweat from his brow after the announcement, but I can't be sure.